We can rethink city and town centers. Old Town Square is the historic square in the Old Town quarter of Prague, the capital of the Czech Republic. 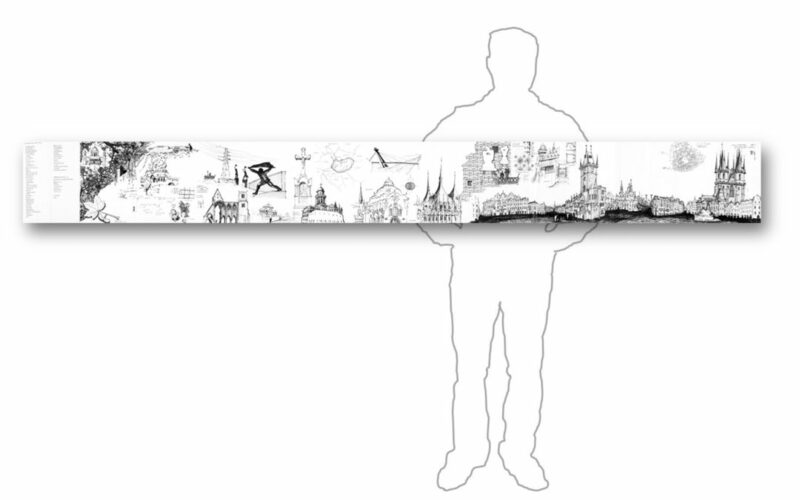 I spent an afternoon mapping the city and drawing the panoramic view on the previous pages that is about six feet long. I stood at the center of the square and rotated across the scene. You can see that the buildings on the far left and right are the seam. I also drew a diagram of the plan with the white space as the open space at the center of the city’s dense maze of streets. Like so many European squares, this one restricts auto traffic to make room for pedestrian interaction and bicycles. See chapter 9, Big City 2: Los Angeles for a description of the Sixteenth Street Mall solution in Denver. I referenced my experience with shared bikes in the section “Japan: Bonus Insights—The Teahouse and General Observations.” Europe embraces bikes and scooters more than the United States does. Many of the European and Asia cities are so old that the roads are very narrow. Two wheels in line are simply more practical for getting around. Plus, the parking for cars is limited at best. Over the summer of 2015, my wife and I bought single-speed beach cruiser bikes for ourselves and our kids to use at our family New Jersey Shore house. I am now hooked on summer riding around town, between towns, and even just a block to the beach or to visit friends on the bay. Author and illustrator: Charlie Szoradi is an architect, inventor, and the CEO of Independence LED Lighting. He writes about many other topics related to town planning, such as Old Town Square in Prague, through his extensive travels around the world. If you have found this posting online, it is an excerpt from Mr. Szoradi’s book Learn from Looking that served as the inspiring seed content for this drawing share resource. For additional drawings and insights on Old Town Square in Prague, we hope that you enjoy exploring LearnfromLooking.com. You can search via general terms such as sustainability as well as narrower terms such as suburban town centers or Old Town Square in Prague.